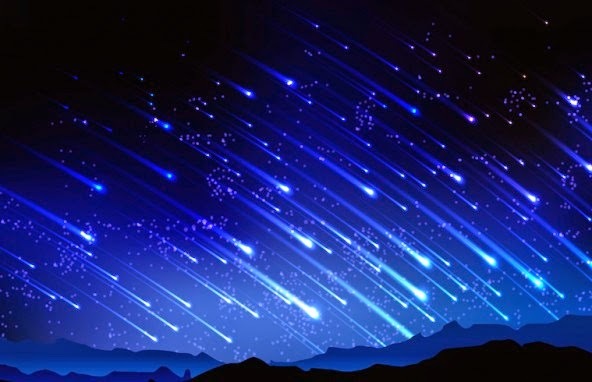 Chrysalis Whisperer: Meteor Shower Tonight!! The Camelopardalids will be putting on a show for us tonight. It's a new one, and an obscure one (And more than a mouthful to say). According to predictions, there should be enough "Ohh, Ahhh," factor to rival the Perseids. So the peak time is tonight between 11pm and 1pm Pacific time (Between 2am and 4am Eastern time). I'm very excited to observe them and enjoy the feeling of safety that our Earth's Atmosphere provides us, sparing us from an attack from the Vermicious Knids. The "K" is not silent. K'NIDS. Vermicious Knids (about as many syllables as Camelopardalids) are huge, dark, egg-shaped beings who do not have any teeth, but swallow their victims whole. They are at home in the vacuum of space, originating on the planet Vermes, a fictional planet located 184,270,000,000 miles from Earth (52 times Pluto's distance). Their weak points: 1) They are show-offs. They cannot resist shaping themselves into letters formulating the word, "SCRAM" (the only word they know) before attacking. 2) They are not heat-proof and do not own retro-rockets and therefore cannot enter Earth's atmosphere without being burned up by friction. According to Willy Wonka, what we silly human beings think to be shooting stars are actually legions of Knids burning up in the atmosphere. So my advice? Grab a lawn chair and a buddy or two, and go watch the night sky, knowing that the earth is safe from the wrath of the Vermicious Knids. OR…. YOU CAN DO BOTH!! !